"Climate change is here, it is a reality", reports John Vidal. As one devastating drought follows another, the future is bleak for millions in east Africa, he writes. Describing the pitiful scenes, he recounts how, after three years of disastrous rains, the families from the Borana tribe, who by custom travel thousands of miles a year in search of water and pasture, have unanimously decided to settle down. Back in April, they packed up their pots, pans and meagre belongings, deserted their mud and thatch homes at Bute and set off on their last trek, to Yaeblo, a village of near-destitute charcoal makers that has sprung up on the side of a dirt road near Moyale. Now they live in temporary "benders" – shelters made from branches covered with plastic sheeting. They look like survivors from an earthquake or a flood, says Vidal, but in fact these are some of the world's first climate-change refugees. 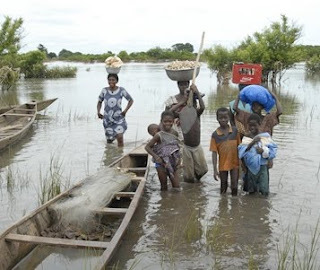 Meanwhile, the UN is telling us that, three weeks after Burkina Faso, in West Africa , was hit by devastating floods, people in the worst-affected areas are struggling to get back to normal. Eight people died when heavy rains swept through Burkina Faso in early September. It was the heaviest rainfall in 90 years. Earlier this month, the same UN announced that heavy flooding had affected some 350,000 people across West Africa, killing at least 32 in Ghana and Burkina Faso. Fortunately, help is at hand. Yesterday, the Church of England launched a "climate justice fund". It will, the earnest clerics tell us, support Anglican dioceses in Africa to respond to disasters caused by climate change, such as flooding. Never mind the contradiction – the BBC has it sussed. 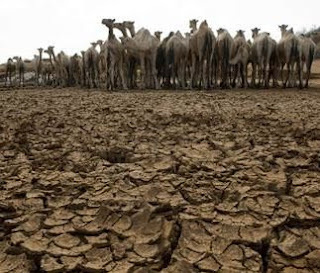 Noting that West Africa has been hit by floods while the east of the continent is suffering from a drought, it airily informs us that "analysts say" that these "twin battles" will become more common as a result of climate change. Come rain or shine, hot or cold, windy or calm ... there is only one cause.